As you found at the end of this post, I didn’t have any pics to share with you from The Beer Junction. Well I’m fixing that now. I made it back to the Junction and it so happened that on that day they were having a neat IPA event called Hop Hysteria. I like a good IPA. When I arrived that day it wasn’t too busy, though it got busy later. From the start, there was an annoying drunk middle-aged guy in sunglasses who was loud and going up to strangers like they were his friends. At one point he was telling strangers to take a drink from the can of ginger beer he had ordered to see what they thought of it. Apparently drunk guy didn’t like the taste of the ginger beer. I assume he didn’t realize that is wasn’t actually beer. One set of guys he who just entered got solicited with this enticing offer and after the first guy declined, the drunk guy said to the second guy “you’re not a pu$$y, you’ll try it” and despite my sending him my strongest ESP suggestions to DONT DO IT, MAN! he complied. Drunk man first noticed me outside when I arrived and I guess he saw something in me that kept him from approaching me that day. Eventually drunk guy left. Quality, interesting craft beer is wasted on guys and gals like this (and gets them too wasted too fast) who really ought to stick to sports bars and their Budweiser, although much of the clientele at craft breweries and beer bars are more similar to him than most people allow themselves to realize. Anyway, upon locking my bike up to a small tree out front and entering the place, I immediately began to study the chalkboard menus in order to try to get a handle on how I was going to proceed. When it was my turn at the counter, the beertender handed me a piece of paper that listed in very nice detail the offerings. As you may know about The Beer Junction from this post, they offer taster sized pours. 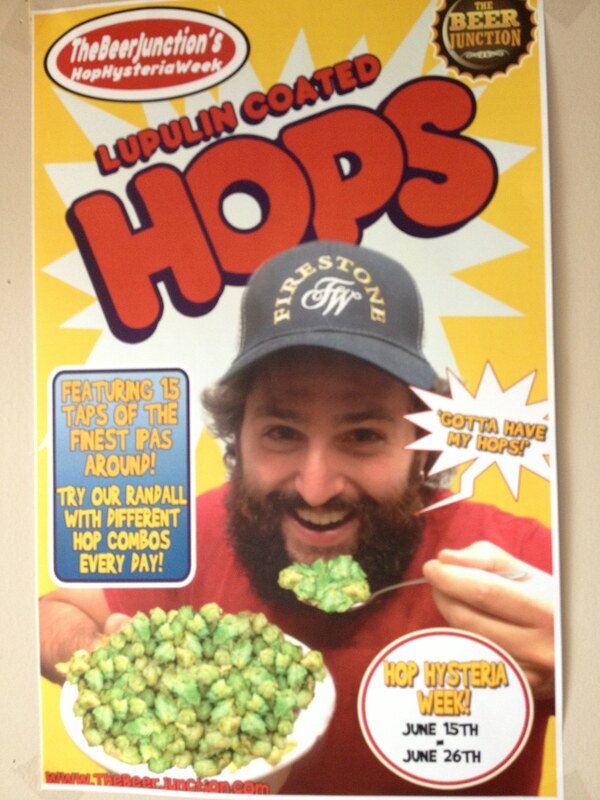 If you at all value variety – and I very much do – this is the only way to approach something like Hop Hysteria, or simply a place with a good number of exciting options on tap. Even so, I had to eliminate a good number of viable choices in order to make this a reasonable experience. I went for their four taster option, as I understand it’s not more expensive per ounce than the eight taster option. This allowed me to order four tastes and enjoy them as I planned my next four tastes. 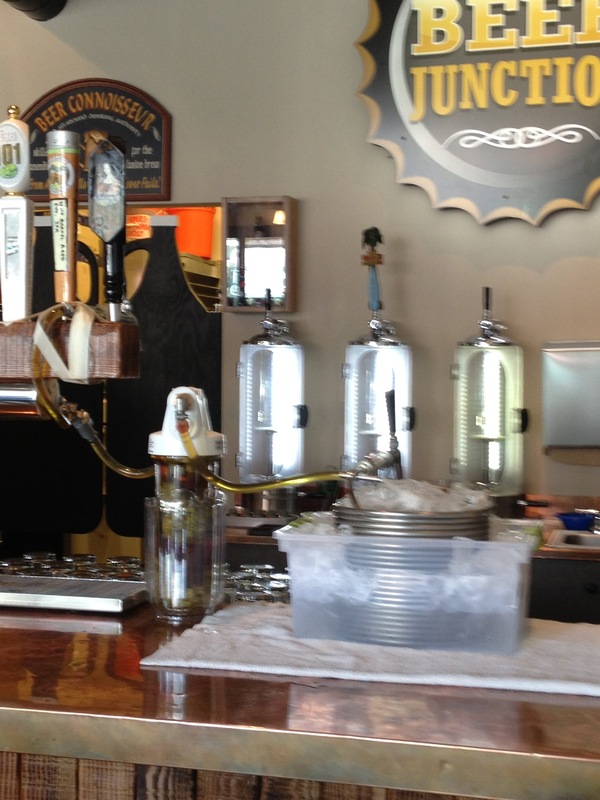 As part of this event, Beer Junction had set up a randall, or a device that pushes beer through a water filter full of hops. The randall setup. I hadn’t before seen a randall set up with a cooling coil after it like this. Note also the growler filling stations in the background. I talked about them below in the prior post. The beer on randall this day was Avery’s Maharaja Imperial IPA. On the menu the randall is touted with an exclamation point as containing Ahtanum hops, so I assume they are a rare or coveted hop. It was tasty. Most of the eight beers I tasted (repeat, tasted) that day were good. Some were great. Despite my affinity for enjoying local beer, my favorite was pretty easy to decide upon: Stone Brewing’s Enjoy By 7-4-2013 Double IPA. It had, for me, the right crisp, citrusy tartness without being unpleasingly bitter on my particular palate. Just awesome. The only downer in the experience that day came when I calculated in my mind what my bill should be. It dawned on me that I had essentially just consumed two $10 pints! In a way I’m glad I was too excited about the beer selection to take a second to realize what my tasters’ prices would amount to in total. Oh well, it was scrumptious fun that allowed me to experience eight different interesting beers. Below I will pop in the rest of my pictures from the day, which will round out this write-up of The Beer Junction. Before doing so I will mention that I did indeed try that route alteration I discussed in my prior posting. This consisted (pull up the map via the provided link) taking Oregon St. on the outgoing trip to connect me straight from Fauntleroy Way to California Ave where Beer Junction is just a stone’s throw to the left. This, I believe, cuts off some distance and keeps you off of some busy roads. The tradeoff is that on the outgoing trip, Oregon St. is quite uphill. In fact, I (as I am known to do) chose to dismount and run up most of the hilliness in order to save wear and tear on my bike. Was it worth it on the outgoing trip? I’m still undecided on that. As described in the prior post, doing so allows you to avoid a significant amount of walking/running your bike on a sidewalk that is almost always congested. But the dramatic climbs come close to canceling out that benefit. Now, when it comes to the return trip, it’s a slam dunk: When you leave Beer Junction, go left and take Oregon St. straight downhill to Fauntleroy Way where you take a left and continue on. The Beer Junction continues to please. Cheers! 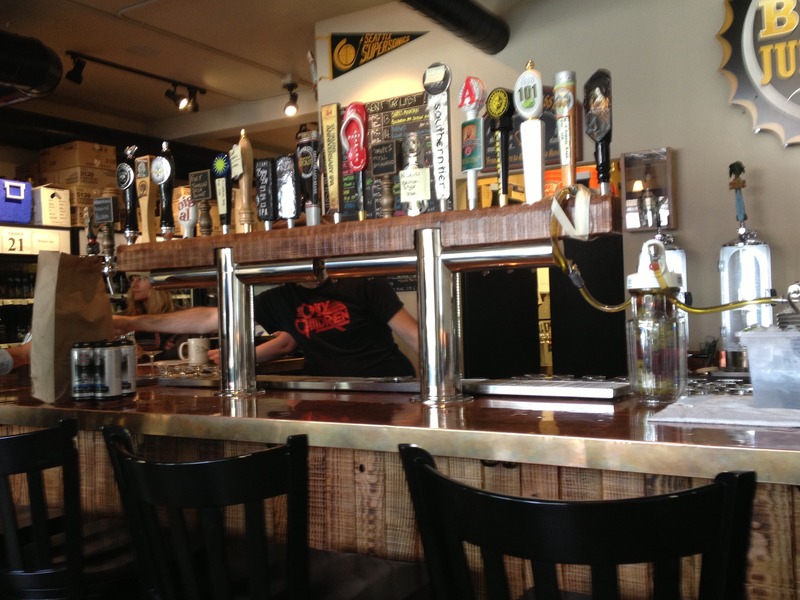 A look at their bank of taps. 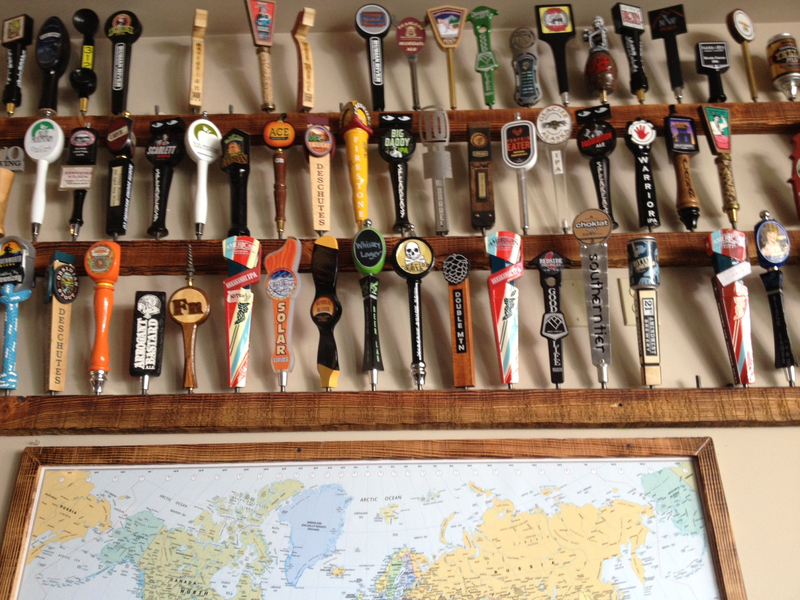 The collection of tap handles on one wall. Below it are found maps for some reason. I could imagine worse decorations I suppose. Tap handles even on the ceiling. Also note the water cooler below the TV – a must in a place that I might consider worthy. A great selection of beer in the bottle shop area. Wow, I notice tap handles even back there! Through those doors at the back and out in the hallway are found the restrooms. The restroom door takes a code that seems to have been kept the same for some time now. It’s time to go to West Seattle and check out one of my favorite places. 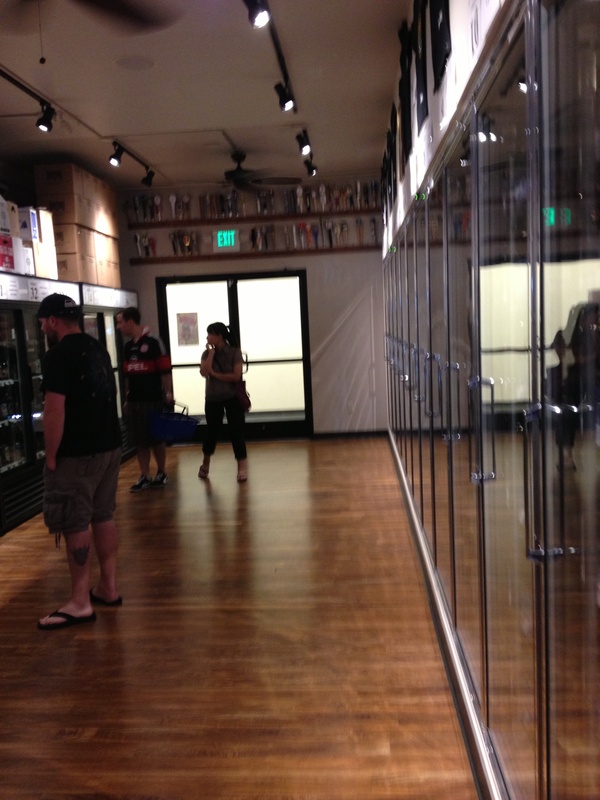 It’s a bottle shop that has lots of great beer on tap. You’ve noticed I’ve become savvy enough to start including maps of my routes. I am, in fact, now starting a post by working up a map. Let me go ahead and show you the map, and we’ll get into the description of the route and the establishment in the coming days. The Beer Junction seems to be a pretty popular place, though I’ve not had much trouble with overcrowding there. Part of the reason for this is it has a service line (makes sense, as it’s still a bottle shop after all). There is, however, a small bar – probably five or six chairs worth. Awesomely, they have provided more seating along the side walls with shallow tables for your beers. The route over to California Junction in West Seattle is a mix of nice separated paths, not-so-hospitable busy streets, and some hilliness. The beginning section of the route is along the trail that runs along Alaskan Wy. and Marginal Wy. This has been under construction for what seems like years now. The “street view” images on the provided map show that. It has undergone several changes and detours, so all I can tell you at this point is just try to follow the map and any signs you see as you ride. The most notable part of the route is the crossing of the low-level bridge to West Seattle. There is a protected pedestrian/bike path over the bridge that is oh so enjoyable! As stated, the route from the ferry terminal on the Elliott Bay Trail is in flux for a bit along Alaskan Way. The trail at first is on the east side of Alaskan Way, then at a certain point (indicated by big orange signs usually) you cross over to the west side of the street. There is a nice new section of the trail that runs on the west side of Alaskan, complete with street lights. At a certain point the separated trail ends and you are left to either ride on the sidewalk with its rim-bending bumps, or get out on the road (now called Marginal Way) with its bike lane and frequent semi-truck traffic coming or going from the docks. Really though, riding out on the bike lane isn’t too bad. There is, for some distance, striping delineating a buffer zone between the bike lane and the car lane. Even after this disappears, I don’t feel all that bad out there despite the truck traffic. It’s a flat ride here, and I enjoy opening it up, full of hope and excitement at the beginning of my beer outing. Yes, if I’m heading down south here, I usually do it first, before heading up north toward Fremont, Ballard, Greenwood, or wherever I am adventuring that day. When you arrive at the overpass – Spokane St., you see a friendly set of green signs. They talk about trails. Honestly, I’ve never really known just which trail I take. I imagine I am on all three before I’m done. At any rate, this is where you turn right and sort of start your trail ride toward the bridge. As described in our map, you do a couple little juts across traffic, a good amount of which is semi trucks, so use cation of course. After this, you are at the stop light intersection (11th Ave) where you cross the street, essentially getting diagonally across to head onto the bridge. I have seen cyclists literally go diagonally across the intersection. I may try this if I see there is no traffic. As it is, there isn’t usually much of a wait to cross the crosswalks. Now, if you want to avoid this intersection you can do as the engineers intended, and stay straight, then let the trail loop you under the bridge, then back around to where you can get on. Now you get to climb up the bridge. Shortly after you come off the bridge, you have a choice of like three directions you could go. I used to follow the trail to the right (the Alki Trail according to the sign). this takes you down to an intersection where you wait, and wait, for your chance to make something like three crossings of roads. I guess I used to think I had to stay on the Alki Trail. But doing so actually takes you out of your way in addition to adding in those long waits. So, instead of heading down and to the right, go up and straight ahead. This takes you to to where the trail becomes a sidewalk and curves left, paralleling Delridge Way. Stay riding on the sidewalk, crossing over various cross streets and driveways until you reach the stop light intersection at Andover St. This intersection is recognizable by the huge American flag that is almost always flying in front of a building. Dismount and use the crosswalk to cross Andover St. Once across, find a safe time to get out onto the roadway. Continue, passing the big fitness center on your left, until the road takes a 90 degree left. Follow it, then take the next right at Yancy St.
Get ready for the steepest climb of the trip. At the top, you need to turn left onto AvalonWay. No trick to this one – just wait for a break in traffic and cross over. Watch for cars coming out of 30th Ave. on your left also while you wait. Now you begin a fairly gradual ascent on Avalon that lasts about 1/2 a mile and takes a right curve. At 35th stay straight. At the next light, Fauntleroy Way, turn left. As you wait for the light, observe the sign on the building across the street that reads in large letters “non-violent martial art.” I always enjoy a chuckle at this. Now on Fauntleroy, be advised that as you approach the cross street Oregon St., your lane becomes a right turn lane so you must be cautious about that as you proceed straight. As I write this, the idea has finally dawned on me: Why not take Oregon St. right and let it connect you to California Ave? Seems like a shortcut and a less busy street. Then I remembered Oregon is way steep. I will consider using Oregon St. next time though, as it may be a good trade-off. I almost certainly will use Oregon St. on my next return trip from Beer Junction as it seems like a great short cut heading that direction – especially since where Oregon intersects Fauntleroy there is a stop light, so turning left should be no problem. Today, having stayed straight on Fauntleroy, you are treated to a view of the nice, clean, large, new Trader Joe’s on the right. Next, you find the stop light intersection with Alaska St. Turn/curve right. Then proceed straight until you reach California Ave. No bike facilities on this stretch of road, and it’s fairly busy. I don’t recall having any nasty encounters here though. I imagine this is due to drivers being accustomed to seeing cyclists around these parts. Once I cross the street at California, I dismount and walk/run on the sidewalk about 800 feet until I reach The Beer Junction! Another bright idea for improvement has just occurred to me: Given that the relatively narrow sidewalks here are pretty populated with walkers and shoppers – at least on non-rainy days – I wonder if it would be quicker and less frustrating to, instead of walking on the sidewalk to our destination as I recommended, make the right turn onto California Ave, ride to the next light, then dismount and cross the street and make the much shorter sidewalk trek to Beer Junction. I will try that next time. 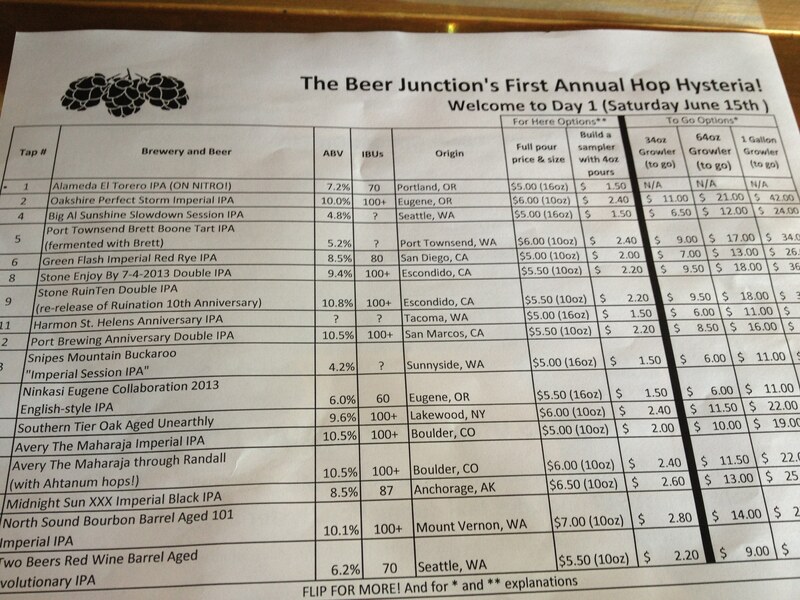 Well, good job making it over to West Seattle and the little beer-lover’s playground that is The Beer Junction. I will go into a bit more depth on my impressions of the place next. After locking up to a tree near the storefront, and by so doing, partially blocking their sandwich board, enter and be greeted by a chalkboard overhead that lays out what’s on tap. Look ahead and to the right and see another chalkboard that does the same. If I recall, one of the boards specifies the ABVs. Proceed straight ahead and you enter the bottle shop area which is plenty impressive. I’ve spent a little time browsing it while sipping a beer. Yes, nothing like drinking an interesting beer while window shopping for interesting beers. An extensive selection of tasty beers is offered by Beer Junction both in the bottle shop and at the taps up front behind the small bar. For a corkage fee, you may enjoy that interesting bottle of beer in a glass. Also offered are growler fills. The Junction, in fact, was one of the first places I saw one of the fancy new growler filling devices that supposedly do a better job. I say supposedly. The first place I saw one was at Georgetown Brewing, and I haven’t been able to tell a difference in the beer I get from there. One benefit is that the unopened growler of beer is supposed to stay good longer. At any rate, it does seem proper that the vessel of beer you purchase and take home should be filled by some method more scientific than sticking a neoprene tube down it and dispensing into it like a pint glass. The device looks impressive at least. Always trying to keep my beer budget under control, I only get my growlers filled at a few key places around town – places that at least for now offer fills for around $10 (I shoot for $8). But you’re not going to get a fill of that Port Brewing or Ft. George awesome beer for $10 you say? That’s correct. I’ll stick to enjoying those interesting beers in smaller doses and leave the exotic growler fill prices for those who can better afford them. Speaking of smaller doses, here is one of my favorite things about The Beer Junction: They deal willingly in the realm of the taster-sized pour. They even officially offer a splash. The pricing for such – even for the splash! – is laid out on their chalkboards. Talk about offering versatility! They have 4 taster set and an 8 taster set. Just say you want to do the taster thing and the friendly guy behind the bar hands you a sticky pad on which you write your numbers (corresponding to the numbered beers on the chalkboard) and he will dutifully pour and place the tasters in a wooden paddle for you to savor. The last time I was there, I took a look at my receipt (yes, they gave me an itemized receipt) and I confirmed that the price-per-ounce is higher than with a pint pour. This is to be expected, but I guess I am spoiled by the awesome and very surprising policy of The Junction’s smaller and older counterpart – the venerable Bottleworks’ – policy of charging the same price per ounce for 1/2 pours as for full pours. I mentioned that the beertender would probably be friendly. Here is the other of my favorite things about The Beer Junction: Friendly staff. There is one guy who strikes me as the owner who is particularly professional and friendly. He’s fairly young, so maybe he’s the manager or something, but he’s always been good. In fact I don’t recall any bad service to date from this place – a remarkable thing in today’s climate. The atmosphere at Beer Junction is clean and pleasant. There are a couple of TVs that usually display sports of some variety. 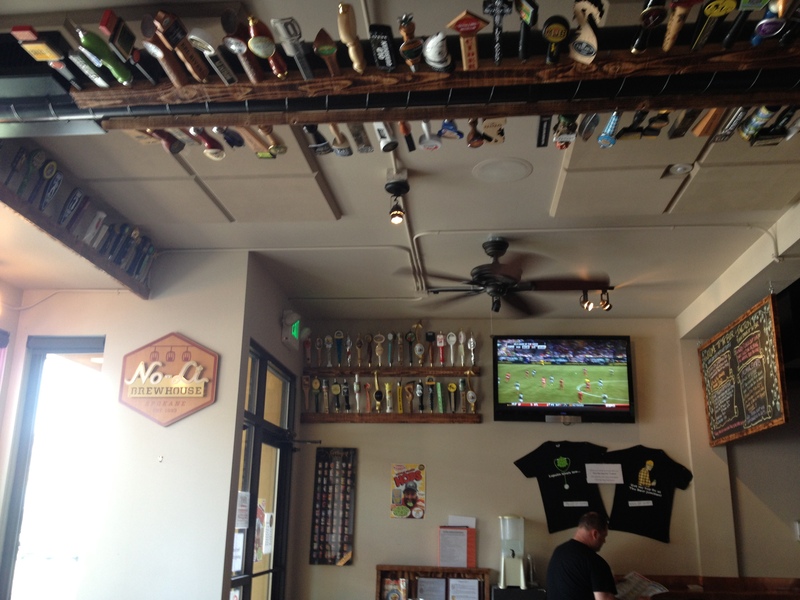 On one of the walls are on display rows of tap handles – always fun to view. The space appears to be newly renovated. There are no restrooms, but just go out the glass doors at the back of the place into the hallway and you find shared restrooms with code-locked doors. You’ll have to ask a staff member the code. On nice or sunny Seattle days the front windows are opened, almost transforming the indoor tables by the windows into outdoor seating, as they are opened up right onto the sidewalk. One day I enjoyed an interesting sight as a boy stood just outside one of the open windows looking in and licking an ice cream cone and very near him on the other side of the low wall separating inside from out sat boys of a more advanced age savoring their treats. Beer Junction, I’m thankful for you. In the craft beer on-tap world there are too many places where exists an abundance of attitude, entitled punk employees, a lack of information and of appreciation for the customer. At The Beer Junction I feel like just what I am: a customer choosing to spend my beer dollar here. I hope they keep it up. Oh, and they have great beer. We’ve already discussed a bit of detail regarding the ride back. The only further note may be that once you reach Marginal way (the spot where I said the trail sort of really begins) you can either ride on the sidewalk “against traffic”, or you can cross over and ride on the road where I believe you will find bike lanes most of the way. At a certain point, the Elliott Bay Trail picks up (again, the area is under construction, so this point varies unfortunately). Thanks for joining me on this journey over to West Seattle. I wish I had some photos of the place, but hey, just google it. I look forward to our next adventure.